Studio and family motel units. Blue Peaks Lodge offers motel style accommodation with a choice of 2 bedroom, 1 bedroom and studio motel units, most of which are fully self contained with kitchen facilities. Our aim is to provide a home away from home in our moderately priced units. Enjoy our modern spacious comfortable units, handy to all shops, sporting complexes and restaurants. Award winning vineyards within 10 minutes. Ski fields within one hour's drive. Clean, comfortable, self-contained units. Only 5 minutes walk to town. Centrally located, spacious family & studio units with Mt views, set in quiet garden settings. Units are self-contained with full kitchens, ensuites & sky tv - triple heating, direct dial phones. 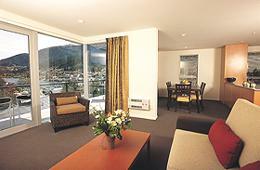 The Waterfront Apartments offer you Queenstown nightly accommodation at its very best. Lakeside Apartments (fully-serviced apartments) sit in harmony with a host of world-class resort amenities, amidst great cafes, restaurants and wineries, combining all the wonderous ingredients for a memorable holiday. Lake Wanaka Lodge in the South Island of New Zealand is the perfect Hotel Motel Accommodation in Wanaka to relax at in privacy or take advantage of the many activities in Wanaka New Zealand. Dramatic lake and mountain views set overlooking beautiful Lake Wakatipu towards Walter Peak. The most spectacular of the Maju Sequence, the Queenstown apartment redefines the concept of luxury living. Simply the best address in New Zealand. Wake up, atop the mountain. Feel the crisp alpine air. It's not very often you can stay on a mountain overnight in New Zealand. This quiet, comfortable and relaxing 4 star-rated motel is located on a 18-hole championship golf course. All suites & apartments attract outstanding views of Lake Wakatipu and the Remarkables Mountain Range towering 6000 feet above the lake that makes Queenstown so famous. Wanaka Springs is a place of comfort and beauty, offering luxury accommodation in tranquil natural surroundings. Our accommodation is set in a peaceful garden setting enjoying glorious mountain views, including Treble Cone skifield. We are an ideal base for the region as we are situated 1.5kms from the town centre. Relax in comfort in Cromwell's proven four star plus Qualmark rated property in close proximity to shops, restaurants, wineries, goldfields trails. Riverrun, stylish luxury accommodation six minutes drive from Wanaka resort and one hour from Queenstown in the heart of New Zealand's Southern Alps. Self contained units central to town. Swimming pool, spa pool, guest laundry, ski drying, off street parking, fax facilities, Sky TV. Closest motel to downtown Queenstown. Walk to shops, restaurants, bars, and nightclubs. 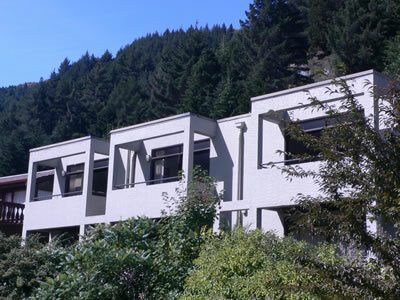 Double/twin studio units with one of the best views out to the lake and mountains. 1 and 2 bedroom self catering units. Opposite golf course. Aaron Lodge features park-like grounds with childrens playgound, spa pool, 'mini park golf' and petanque piste. Seven two bedroom units and 2 studio units with full cooking facilities, central heating, Sky TV, queen size beds and large spacious lounges. Next to restaurants and shops. Next to restaurants and shops. The luxurious and welcoming three-bedroom apartment with central heating, double glazing and underfloor heating to the tiled areas is in the heart of Wanaka township. If the name conjures up images for you of warmth, a roaring fireplace to share with friends or an unashamedly romantic retreat - you already know some of the Hot Toddy story. Situated in the heart of the Wanaka Township these two units have exquisite views of the lake and surrounding mountains. Situated close to Hotel, the Town & Country Club, bowling club and golf course and only 300m to Lake Dunstan. If you want to stay in a place of intense luxury, sophistication and beauty, you really must stay at Villa South Pacific Luxury Lodge. Abbey Lodge boasts Hotel, Motel and Apartment accommodation right on the doorstep of Dunedin’s award winning Botanical Gardens - a picturesque location for your Dunedin stay. Situated in acres of lawns and gardens BAYVIEW Motel is located about 2 kilometers from the centre of Lake Wanaka township. Fully self contained 2 bedroom apartment, stunning mountain views, with all the comforts of home (air conditioned, sky tv, full kitchen facilities). The Moorings Wanaka offers stylish quality accommodation for the discerning traveller. Clearbrook is a luxury accommodation complex, designed to enhance the ultimate Wanaka experience. Stunning views across the lake to the Remarkables Mountains can be enjoyed from the Garden Bar & Restaurant. Launched in May 1999 the Lady Pembroke was built by Wanaka Houseboats Ltd. The motel is situated off Route 6, just 14km from Wanaka for access to Mt Aspiring National Park or en route to the West coast. A high standard of service and hospitality to ensure your stay at Hurleys is a memorable one. The unique combination of living spaces makes The Haddens ideal for both families and professionals looking for rest and relaxation. Modern apartments offering a wide range of services. We offer unique luxurious self contained Wanaka accommodation. Situated in a magnificent garden setting this Wanaka apartment and house to rent offers 'the best view in the Wanaka area'. A beautiful location and better than bed and breakfast. Set in a peacful garden setting with alpine views, the Motel has a large in ground swimming pool with attached paddling pool, a children's play area, a ski drying and storage room, cooked and/or continental breakfasts. Quality accommodation in five individual self contained apartments. Ten spacious motel units, set back from the street for quietness. Spacious grounds, plenty of off-street parking. Small tours catered for. Spa pool. Our Lodge and cosy Bed and Breakfast rooms are very highly recommended by all who have stayed. Immaculate designer style units with magnificant views. Wanaka Homestead offers luxury lodge and cottage accommodation, 200m from the shores of Lake Wanaka. The town of Wanaka is only 15 minutes from Cardrona and Queenstown is a 45 minute drive away. Self-contained apartments with Lake and Mountain views. We are nestled in the heart of the Southern Lakes tourist resort of Wanaka and the gateway to the Mount Aspiring National Park. Wanaka is a playground with an abundance of activities for the young and not so young to enjoy. It's only 8 minutes walk from Autoline Motel to the town centre and gardens. Spacious contemporary living with alpine charm. Amity Lodge is a Qualmark 4-star motel situated in a quiet, sunny, central location providing views of the surrounding mountains. If you are looking for the ultimate in luxury accommodation in Queenstown, New Zealand then you need look no further than Matau apartment. Located on a prime central Queenstown site with spectacular views from every room, a stopover at Brunswick is a unique New Zealand experience..
Sky TV, 3 units have standard baths, guest laundry.